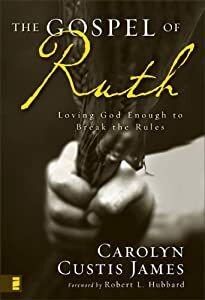 The Gospel of Ruth: Loving God Enough to Break the Rules by Carolyn Justis James has all the Cover via Amazon ingredients of a nutritious meal for the brain yet still comes across as dry, like an over-cooked meatloaf. The study of Ruth is great. The personal anecdotes are powerful. The writing is good. But it lacks vitality. It might be an air of melancholy, but I'm not sure. There is also a glaring omission. James has done her research well and presents new insights into this short story from the Old Testament. I am very grateful for the new things she has brought to me from recent scholarship. I also found her personal story heart wrenching. She identifies with Ruth as someone who is also in a marriage that did not produce children. Her ability to identify with Ruth's pain and bridge the distance between a character on the page and her own experience is one of the best aspects of this book. But there was another experience that happened in the midst of writing this book, that seemed to cast a pall over the rest of the book. Just as Ruth and her mother-in-law, Naomi, lost husbands and sons, so, too, did James lose a brother-in-law on a mountainside in a blizzard while alpine climbing. Both Naomi and Ruth spoke about his kindness (Ruth 2:13, 20). Boaz provided water and food for Ruth. He provided and personally passed the roasted grain to her, and ate with her. She ate and was satisfied. This is a picture of the communion that we enjoy with Christ in His kindness. He invites us to dine with Him. In His kindness, the Lord not only provides the spiritual food that we need, but He wants to have fellowship with us. Boaz was a kinsman redeemer, and under the law the kinsman had several responsibilities. See Image via Wikipedia Leviticus 25:25 and Deuteronomy 25:5-10. Christ is our kinsman redeemer. he had to be willing. The Lord Jesus, as our kinsman redeemer fulfills these requisites perfectly. See Hebrews 2:14-15 and 1 Peter 1:18-19. If Ruth is a picture of the Christian (or Church) then Boaz is a picture of Christ our redeemer. Having decided to redeem Ruth, he set out to settle the account with the person who had a 'legal right over her'. Who had a legal right over us before Christ came along and paid the price. In the presence of elders of the city, Boaz made a legal deal, with reliable witnesses, and 'purchased the right' to marry Ruth. It's curious to me that she doesn't spend any time mining this rich vein of theological reflection. I think it would alleviate her frustration with the end of the story. It might have also helped her avoid reading into the text such an earth based and time constricted thesis. I have many feminist sympathies, but I can't go as far as James wants to bring me. Just as the Apocalypse of John finishes the Bible with a focus on Jesus, because he is the hero, so, too, does Ruth end, not with a focus on the redeemed, but on the redeemer, who is a picture of Jesus Christ. This is why the ending is a good ending and why Boaz is the hero in Ruth's story. It's not a feminist story by intent, but a set up for the mission of Jesus, a picture to anticipate his work. As an aside, I read this on my Kindle. Shortly after I received the device, Zondervan briefly offered this book for free in the Amazon Kindle store. I did not notice any formatting issues and enjoyed using the light weight device to read a longer book.